Since the enactment of the recent healthcare legislation, for-profit healthcare systems and private equity firms have been acquiring not-for-profit hospitals throughout the country. Often times, these acquisitions provide the opportunity to turn old, energy-inefficient not-for-profit hospitals into modern, energy-efficient facilities able to measurably increase profit by reducing energy related operating costs. Private firms like Vanguard Systems, Cerberus, Lifepoint, and Ardent – all in the process of acquiring not-for-profit hospitals – have stated their intention to make major capital improvements to these hospitals. Since hospitals are one of the most energy-intensive building categories, these private health systems providers should consider upgrading their lighting, heating and cooling systems, building envelope, lab equipment, laundry equipment and kitchen equipment to make them more energy-efficient. Many of these capital improvements are potentially eligible to receive major tax deductions through the federal EPAct legislation and save significant energy costs. Pursuant to Energy Policy Act (EPAct) Section 179D, hospital owners making qualifying energy-reducing investments can obtain immediate tax deductions of up to $1.80 per square foot. As a group, hospitals are well behind other building categories in addressing energy reduction. By some estimates, these private firms can realize up to a 15% increase in operating profits from energy savings. Unlike most other capital improvements, energy retrofits qualify for tax incentives and utility rebates while saving energy costs over the lifetime of the technologies. EPAct lighting deductions are based on reductions of energy use below wattage levels provided in ASHRAE 90.1, 2001, which sets wattage target rates for various categories of buildings. For a reduction in lighting power density of 25 percent below the requirements of ASHRAE 90.1, 2001, a facility is eligible for a deduction of 30 cents per square foot for the space where the upgrade took place. As the reduction in lighting power density increases, the deduction also rises, reaching a maximum of 60 cents per square foot for a 40 percent reduction in lighting power density. The maximum 60 cent per square foot lighting deduction is typically achievable by installing highly energy efficient LED, fluorescent or induction lighting in place of existing incandescent or metal halide bulbs. EPAct tax deductions of up to 60 cents per square foot are also available for both the HVAC system and the building envelope if an investment into either system reduces total building energy cost by at least 16.67% as compared to ASHRAE 90.1, 2001. Since a hospital is a facility commercial property category where patient comfort (air-conditioning or heating) needs to be provided 24/7, HVAC is one of the biggest hospital energy needs. To cool the building, hospitals often use chillers. If the hospital is less than 150,000 square feet, then the installed energy efficient chiller will most likely trigger an EPAct HVAC tax deduction . Hospitals exceeding 150,000 square feet that use very efficient HVAC system types, such as geothermal heat pumps or thermal storage, will typically generate large EPAct HVAC tax deductions. Projects that are LEED certified are naturally platformed for tax savings, because energy efficiency is the most weighted sustainable building feature in the LEED rating system. Leadership in Energy and Environmental Design (LEED) is the fast-growing marquee standard for sustainable buildings. Established by the U.S. Green Building Council (USGBC), LEED’s four certification achievements start at the LEED-certified level and proceed to the higher levels of silver, gold, and platinum. Most excitingly, the latest edition of the LEED certification program specifically recognizes hospitals as a distinct building category and sets specific guidelines for achieving maximal energy efficiency. In addition, LEED buildings have already been modeled with a building energy simulation model, which can be adjusted to fit the EPAct energy simulation model required for a whole building (maximum $1.80 per square foot) EPAct tax deduction . A hospital without capital is "like a person in cardiac arrest," unable to compete in an increasingly competitive and fast-changing arena, says Jim Unland, president of Health Capital Group in Chicago and the editor of the Journal of Health Care Finance . One of the simplest, most effective ways of reducing the operating cost of hospitals is the energy cost reduction. By reducing the amount of energy use, hospital owners can increase their operating profits. Since most of the major private hospital acquirers have already pledged major post acquisition capital improvement projects, this is the opportune time to consider energy efficiency. The savvy acquirers can use EPAct to incentivize the promised capital upgrades and then apply the same opportunities to their existing facilities. See Charles Goulding, Jacob Goldman, and Malcolm Thomas. 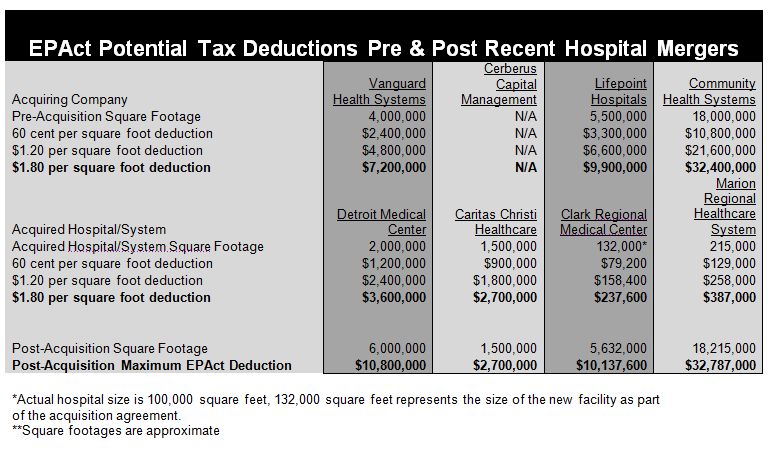 Lighting Upgrades May Bring Tax Savings for Hospitals, Building Operations Management, March 2010, at 35. See Charles Goulding, Jacob Goldman and Joseph Most, The Energy Tax Aspects of Chillers, to be published in Corp. Bus. Tax’n Monthly. See Charles Goulding, Raymond Kumar and Kenneth Wood, New Efficient HVAC Drives Large Tax Deductions for Buildings, Corp. Bus. Tax’n Monthly, May 2009, at 11. See Charles Goulding, Taylor Goulding and Amelia Aboff, How LEED 2009 Expands EPAct Tax Saving Opportunities, Corp. Bus. Tax’n Monthly, September 2009, at 11. See Jenny Gold, Mergers of for-profit, non-profit hospitals: Who does it help?, USA Today, July 2010 < http://www.usatoday.com/money/industries/health/2010-07-13-hospitalmergers13_CV_N.htm>.